From Tourrettes sur Loup, the highway clings to the forested edge of the Gorges du Loup, dipping south and then north again to Vence and St. Paul De Vence. The medieval center of Vence also attracts artists of every type; painters, sculptures and writers pursue their crafts around the town square. Henri Matisse designed Vence's Chapelle du Rosaire, and the all-white chapel with blue and yellow stained glass windows is considered his masterpiece. We arrived on market day, and the town center was alive with fragrance and color. Fruit vendors hawked piles of oranges along the narrow streets while shoppers examined the fresh artichokes and tomatoes. Goat cheese, garlic and green capsicum are available fresh almost every day in Vence. The smell of roast chicken and fresh bread chased us down one street and the sight of a tiny wine shop stopped us at the corner of another. I spotted one vendor proudly polishing his bottles of olive oil and wondered how many hundreds of years his family had been selling olive oil. Three hundred years? More? For some vendors and their ancestors, Tuesday means they will be in Vence; Sunday they pack their baskets and beans, their tablecloths and capers and tiny red chilies and head to another town. St. Paul De Vence is another captivating medieval village with its own share of artists and galleries. Ancient stone walls wrap around narrow, sunlit streets, and the pedestrian-only town, wedged high above two valleys on a narrow strip of land, affords a sweeping view of the surrounding hills. After parking at the base of the village and walking up the narrow streets to the town center I came upon a spice vendor with a 10-foot-long table covered with burlap sacks. Each sack was folded down at the mouth and tiny piles of saffron and thyme, sage and rosemary spilled out of the openings. The smell of lavender and basil hung over the heaps of yellow and green spices, and I imagined the many meals of roast lamb and bouillabaisse to follow. The slow pace of the hill towns can quite quickly be surpassed by the sunburned glamour of Cannes. After five days traveling around the villages above the coast, moving into the posh Le Martinez in Cannes was quite the contrast. The 400-room hotel is considered one of the grand dames of Cannes, and my room had a beautiful ocean view with a large bedroom, sitting area and a marble bathroom. 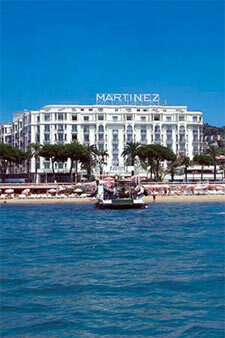 Le Martinez, with its spot front and center on the beach, is all about location, location and location. The city has linked its fate to the annual international film festival, those 10 star-studded days each spring that bring 10,000 celebrities and journalists to the city. Outside of the festival, the city’s eclectic old quarter, attractive harbor, beautiful bay, classy beach-side promenade, sun drenched beaches and crowds of sun worshipers are enough to keep anyone busy for weeks. For those of us unable to get a table at Eden Roc, though, a day trip along the coast may be just what the doctor ordered. After a short drive north out of Cannes, a swing down to Cap d’Antibes will serve as a reminder why we all wanted to be famous in the first place. Along with the scent of sea roses and jasmine, one can almost smell the money in the fresh salt air. Further along the coast, Antibes clings to its history as a quiet fishing village while its tiny fishing boats elbow up to mega yachts and sailboats from around the world. We visited four villas along this section of the coast, and each one thrilled us with stunning ocean views. The dozens of small beaches along bucolic Cap Ferrat are a nice spot to stop for a swim - particularly nice after a climb up to the lighthouse at the southern tip of the lush peninsula. The walls of the secluded villas around St-Jean-Cap-Ferrat do little to hide the fact that the area’s real estate price tags are the highest in France. We stopped at the marina on the Cap and enjoyed a light lunch of fresh seafood and salads along with an enchanting view of the azure bays reaching up the coast to Monaco. From the Cap, Monaco pulls you north like a rip tide. Who can resist the tabloid city of Monte Carlo, Grace Kelly, Princess Caroline and the slew of Ferraris traveling in their magnetic wake? After a tour of the palace and a trip to the casino for a sundowner and a hand of blackjack, you can still hop on the Autoroute and make it back to Cannes in time for four-star dinner.